We were first introduced to the otherworldly ginger goodness that is Jordan Askill at Gemfields, where this Aussie sculptor/designer created a to-die-for amethyst swallow collar and brooch that took our breath away. We're going to assume that Georg Jensen also saw that whimsical masterpiece, because they scooped him up for an exclusive collaboration that launches this month, and we have the goods to show you. If you weren't aware, the Danish design house, now more than 100 years old, has a long and prolific history of partnering with big names to produce artistic jewelry and home collections (see Marc Newson and Ilse Crawford among many others). Jordan's multi-disciplinary background was a perfect fit – the award-winning designer (who now resides in NYC) developed his own ready-to-wear line while working at Ksubi denim, and has also worked for Dior Homme and Alexander McQueen – and his sculptural aesthetic was a match for Jensen's Art Nouveau sensibilities. 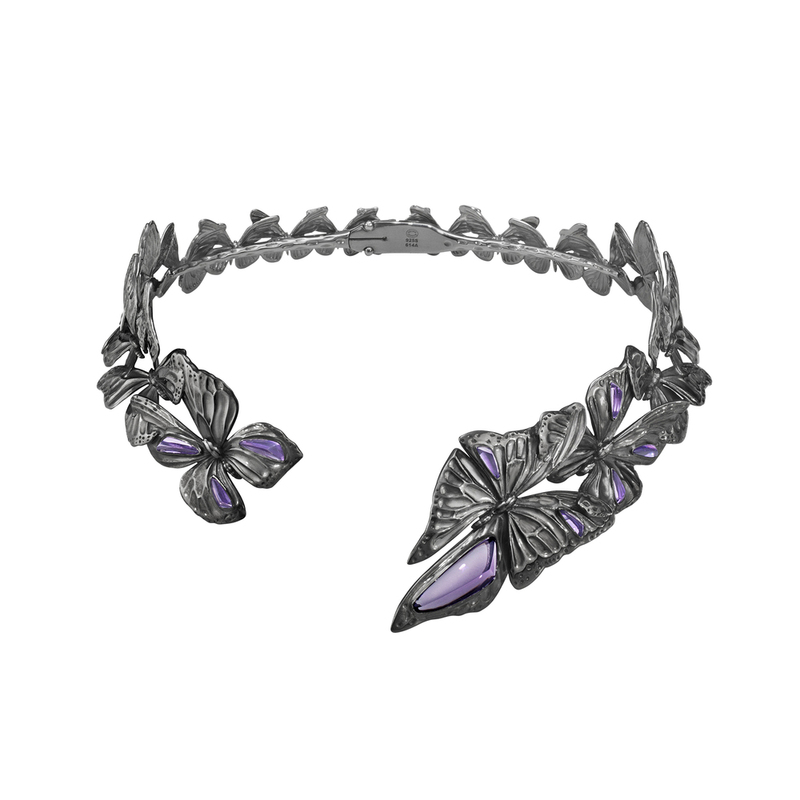 The result is a gorgeous collection based on the butterfly, rendered in sterling silver and featuring limited edition pieces in black rhodium and black diamonds. If that's not enough, we also have a peek at Jordan's newest pieces from his eponymous line that take inspiration from the endangered Violet Canadensis flower and a fierce panther. Read on for the interview and images! The Askill Collection for Georg Jensen neckring in oxidized sterling silver with amethyst. The Askill Collection for Georg Jensen cuff in silver. 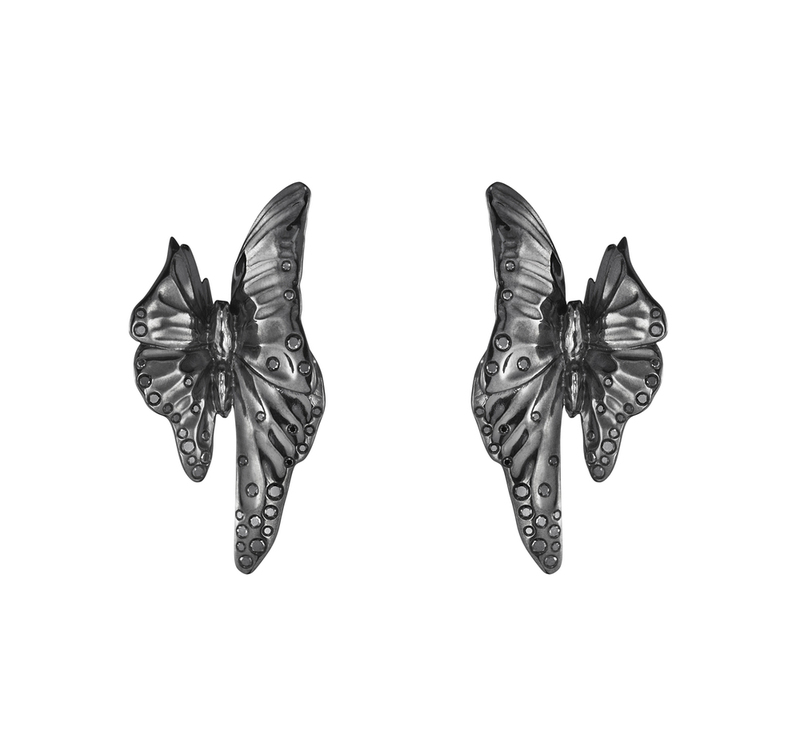 The Askill Collection for Georg Jensen ear cuffs in black rhodium with black diamonds. Jordan Askill hand carved cocholong Panther neckpiece with bespoke faceted rock crystal and diamonds. Jordan Askill Panther cut out earrings with pave and bespoke faceted eye clear rock crystal. The Askill Collection for Georg Jensen Butterfly bangle in 18K gold and diamonds. The Askill Collection for Georg Jensen Butterfly necklace in 18K gold and diamonds. 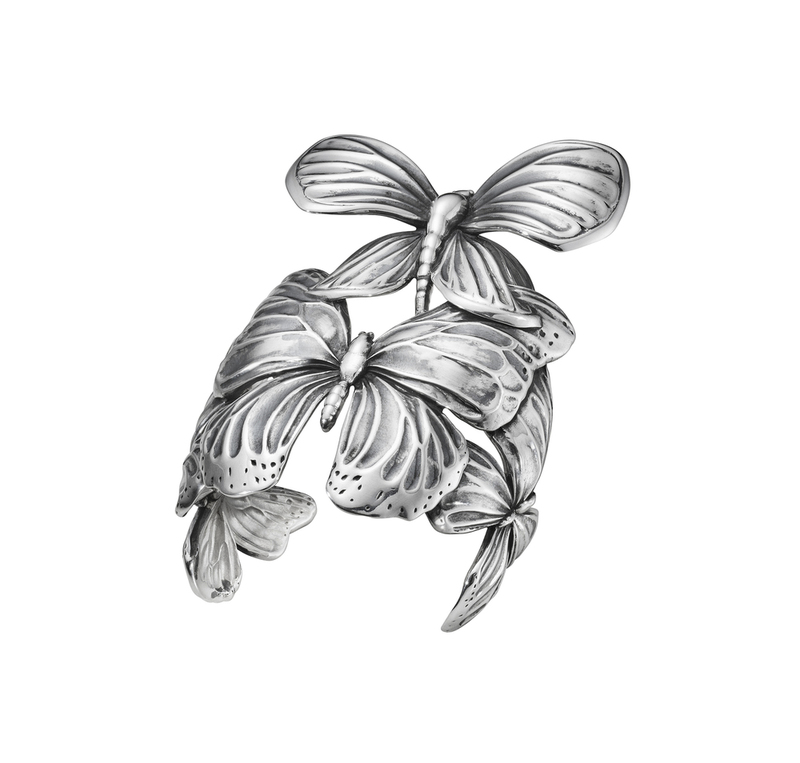 The Askill Collection for Georg Jensen Butterfly ring in 18K gold and diamonds. Jordan Askill 18k yellow gold Viola Canadensis twisted shank ring with bespoke faceted green amethyst. Side view of the Jordan Askill 18k yellow gold Viola Canadensis twisted shank ring with bespoke faceted green amethyst. Jordan Askill Viola Canadensis ring with bespoke faceted Brazilian agate. A model wearing Jordan's sentimental open heart rings. Inspiration from the Viola Canadensis. I love The Boat House in Central Park on a quiet evening. I would love to own a piece from Noor Fares or Fernando Jorge. A hand-carved Cocholong Panther Neckpiece with Bespoke Faceted Rock Crystal and Diamonds. The tonal journey for me of the eye clear rock crystal alongside the carved Cocholong is quite beautiful. What was the first piece of jewelry/watch you bought for yourself? The last piece I bought was an Etruscan revival bracelet. It was 18kt gold with two Chimera heads and ruby eyes. Jeff Koons and Elizabeth Taylor. The most sentimental piece of jewelry I own is a simple open-heart ring. I made this for my friends 7 years ago as a thank you for being there for me and a gesture of love, having spent time living away from them. It slowly made its way into my collection and to retail, as every one wanted one. We have developed thousands of these and what I love is they have been bought and swapped as gifts for friends and loved ones ever since. I love this journey. I like to walk. It helps settle me. 3D software which I use to create my jewelry and sculpture and of course, the iPhone.